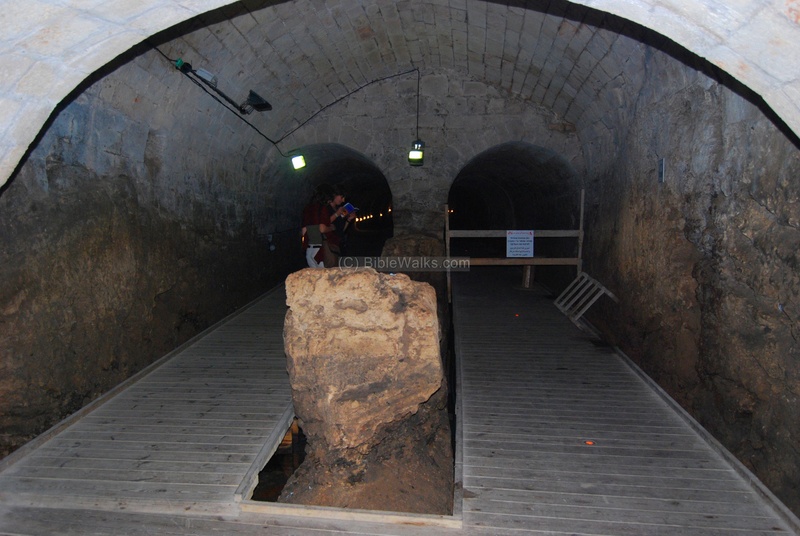 The 12th Century AD tunnel was built by the Crusader Templars to connect their fortress on the south-west side of Acre to the harbor on the south-east side. The Crusaders of the Templars order settled in Acre in the 12th Century AD after the fall of Jerusalem, and built a fortress on the south-west corner of the old city of Acre. They also cut a 350M tunnel into the rock in order to connect the fortress to the port, located on the south-eastern side. 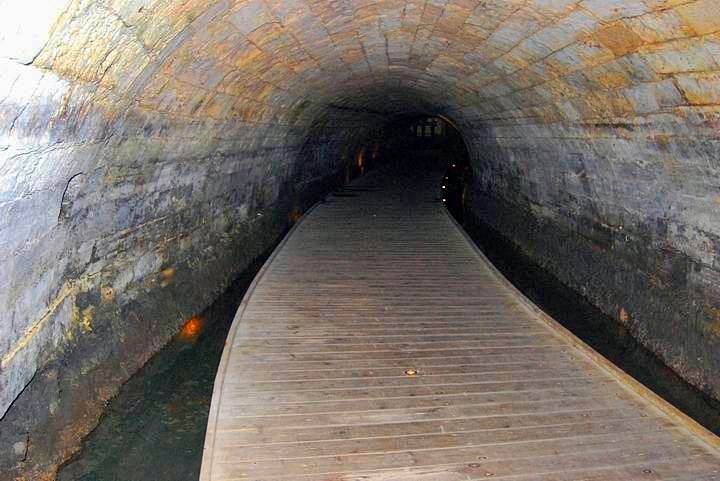 The secret tunnel was recently discovered, cleaned and opened to the public. The eastern entrance is located near KhanAl-Umdan. The Khan is located near the marina, on the south-east side of the old city. 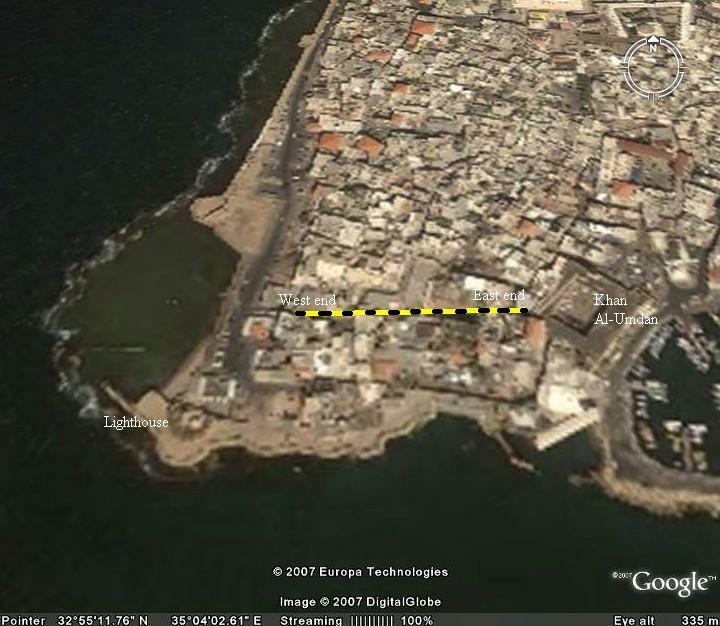 During the Crusaders times, it was the site was an internal anchorage of the port of Akko. The western entrance (or exit) is located near the modern light house, where the Templar fortress was once located. A ticket to the tunnel can be purchased in conjunction to a tour of the Knights hall. The map below shows the path of the tunnel, between the area of the lighthouse (on the left side) to the area of the Crusaders port (on the right side). In 1099 AD the Crusaders conquered Jerusalem, and called the Temple-Mount as "Templum Domini", turned the Dome of the rock to a church, adding a cross on the dome. The Templar Knights military-religious organization was established in 1118, and named their organization after the temple: the guards of the temple. Their task, as defined by the pope, was to protect the pilgrims and patients that visited the Holy Land. The Crusaders were driven out from Jerusalem by Saladin in 1187. The Templars retreated to Acre - the Crusaders last stronghold in the Holy Land - and built their central fortress and palace on the south-west side. The fortress, now gone, was protected by mighty walls and four towers. They also cut a 350M wide tunnel under the rock from the fortress to the south-west side of the city, in order to provide a concealed access to the Crusaders inner port, where Khan al-Umdan was later constructed. The tunnel was cut into the rock as a semi-barreled arch, and its ceiling was reinforced by hewn (cut) stones. 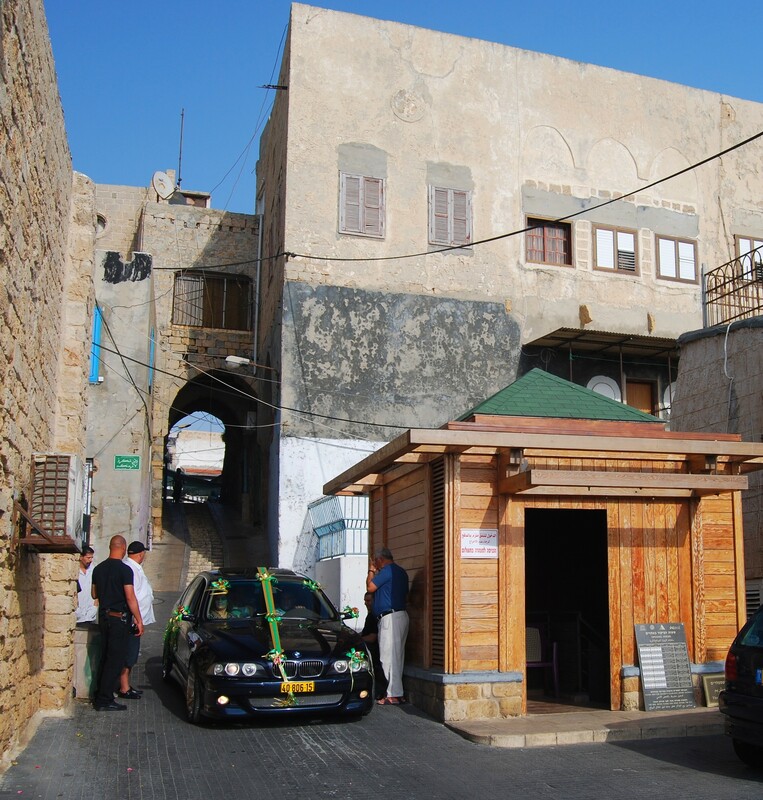 In 1291 the city was taken by the Mamlukes, and was completely destroyed - degrading Acre to a small neglected city until the end of the 18th Century. Over these years, the existence of the secret tunnel was forgotten. The tunnel was rediscovered by chance: In 1994 a woman resident, living above the tunnel, complained on a blocked sewage. 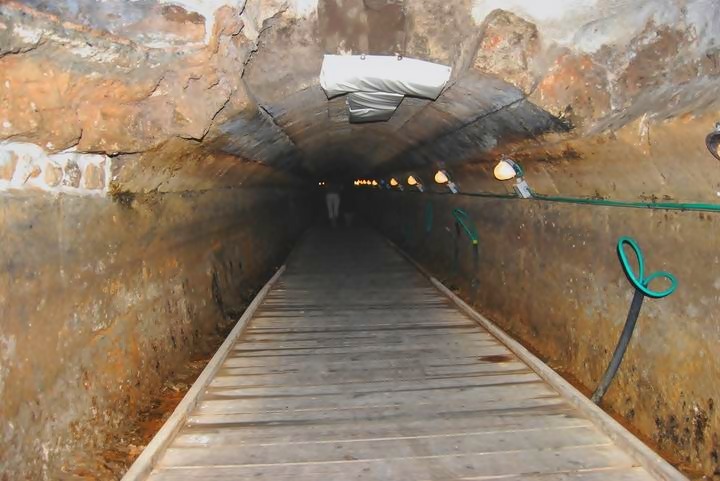 While searching for the underground block, the tunnel was discovered. It was then cleaned out from more than 800 years of dirt and filth. After adding a walkway, lights and access, the tunnel was opened to the public in 1999. A view of the tunnel is seen below. The top part is reinforced by hewn (cut) stones. A split of the tunnel to double arches. The right (south) tunnel is still under excavations and restoration. The walk along the tunnel is recommended, and is one of the new sites added in Acre in recent years. There are more hidden secrets under the houses of the old city, and continued explorations and reconstructions will continue to enhance this beautiful ancient city.